Pacer - the total adhesive system. 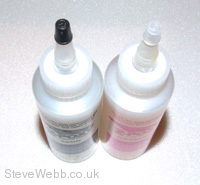 This clear QUICK SET epoxy is probably the best epoxy we have used. 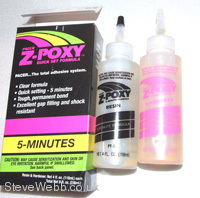 This 5 minutes epoxy formula has a working time, but the grab time is quick. It is very thin and it soaks into the wood, it makes for a stronger bond. Great for foam wings. Bonds balsa wood, foam, plastics, metals and much more.